According to Chinese Medicine, acne can actually be a sign of different health problems depending on what part of the body they appear. There are actually serving as an indicator of which body organ needs attention. Read on to find out the connections between where acne turn up and wha can the problem with your health be. In this case you need to drink plenty of water to flush, keep an eye on your diet, eliminate greasy foods and refined sugars. If you’re craving deep fried fatty foods, eat avocado or add a tablespoon of coconut oil to your dish. Make sure you consume plenty of fresh organic fruits and vegetables. Some of the best antioxidant rich foods or drinks include green tea, warm lemon water and fresh berries. If your diet is not rich in naturally fermented foods such as kimchi, sauerkraut, kombucha, or kefir, consider supplementing with a probiotic capsule daily. Most health food stores carry probiotic capsules. Your heart is a massive organ that pumps blood through your entire body. It has a tough job and can become easily stressed due to poor diet, inactivity, and various mental and physical stresses. If you have pimples on your lower forehead make it a point to do regular cardiovascular exercises. Eating pomegranate and coconut oil will also keep your heart healthy and help clear this up. When kidneys are not taken care of, you may find large, painful pimples on your ears that just won’t go away. Kidney troubles are often caused by not drinking enough water and eating too much sodium. This is as good of a time as any to point out that vendors such as Subway, who tout their products as being “healthy” have an excessive amount of sodium added to almost everything on the menu. The next time that you take a look at their nutrition claims with highlighted low-fat content, take a minute to focus on the sodium column. In addition Subway adds genetically modified soy to nearly all of their foods. Oiliness, redness, flakiness and pimples between the eyebrows can indicate that your liver may have been overworked and in dire need of a cleansing. Cut back on greasy foods loaded with vegetable, soy, and canola oil, alcohol and pasteurized dairy (or dairy altogether). Avoid eating late at night as well. If you’re craving a late snack take a spoonful of raw honey. This will let your liver rest while you’re sleeping. Stresses to the lungs are likely to cause flare ups in the upper cheeks and even break your capillaries. The best thing to do is to avoid smoking and second hand smoke. Follow this link for 15 plants that can cleanse the lungs and boost respiratory health. Gum or teeth problems may contribute to acne in the lower cheek area. Be sure to avoid eating refined sugar and soft drinks. Oil pulling is a great habit to take up if you’re experiencing any type of gum or teeth problems. It’s also a good idea to eat plenty of fresh fiber rich fruits and vegetables to strengthen your teeth and gums from chewing honest natural foods. Flare ups on the sides of the chin are a good indication of hormonal imbalance. This can be due to menstruation, birth control, or a diet high in soy. Sometimes, even emotional or physical stress can cause hormonal imbalances. Get plenty of sleep and make a habit of meditating or doing yoga to keep the mind focused and stress-free. Be sure to take lots of essential fatty acids such as Omega 3s. This is typically caused by a poor diet and food allergies. If your diet is adequate you simply may not be digesting the nutrients you put into it. We were always told that we are what we eat, which is true to an extent. More accurately however, we are what we can digest. If your gut is lacking probiotics and completely out of balance from not eating naturally fermented foods or taking probiotic capsules, it won’t matter how much good wholesome food you’re eating. The nutrients will simply pass right through you. 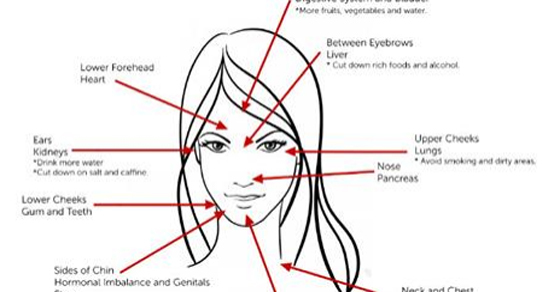 Refer to the upper forehead section to learn more about what to eat to get your gut working properly. Additionally stress, lack of sleep, and dehydration can wreak havoc on your stomach and small intestine. Getting a good nights sleep, drinking plenty of water, and addressing your stress by making lifestyle changes and practicing yoga/meditation are great non-dietary ways to address your chin acne.